Chinese authorities have detained for questioning hundreds of ethnic minority Uyghurs and are hot on the trail of two key suspects in connection with a fatal knife attack on Han Chinese workers building a dam in the restive Xinjiang region, according to local officials and residents. 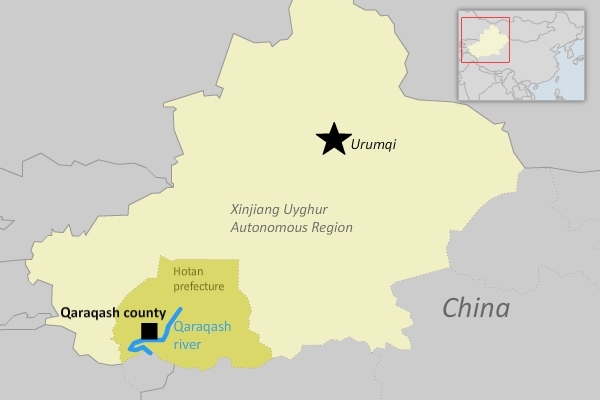 Dozens still remain in custody following the May 20 attack which led to the death of seven Han Chinese workers building a dam on the Qaraqash River in Hotan (In Chinese, Hetian) prefecture’s Qaraqash (Moyu) county. The incident came to light only this month after the Chinese authorities released a “most-wanted” list of 11 suspects in connection with eight incidents of violence in the northwestern Xinjiang Uyghur Autonomous Region over the past year and a half. The Qaraqash incident has not been reported in China’s official media. RFA’s Uyghur Service used the wanted list to trace the circumstances under which warrants of arrest were issued for two of the 11 suspects by contacting officials and residents in the area. The two Uyghur male suspects were identified as Yusup Ehmetqadir and Memtili Tursunniyaz. RFA investigations revealed that around 300 people have been detained for questioning over the incident, nearly all of them Uyghurs. According to the wanted list, the Qaraqash attack was the work of “terrorists” and three of the five alleged Uyghur assailants had been captured by police. Chinese authorities blame outbreaks of violence in the region on Uyghur “terrorists,” but rights groups and experts say Beijing exaggerates the terrorism threat to take the heat off domestic policies that cause unrest or to justify the authorities’ use of force against the Uyghur minority. 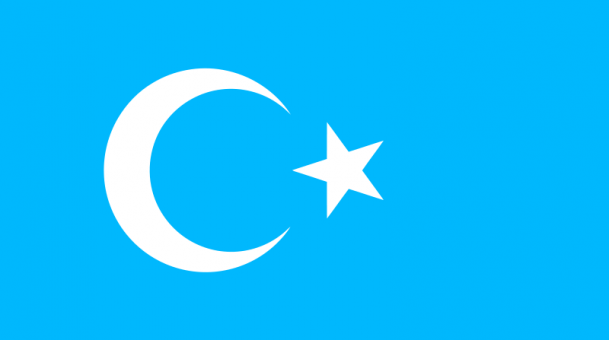 The attack is the latest of a string of violent incidents in Xinjiang blamed on the mostly Muslim Uyghurs, who complain of discrimination by the authorities and China’s majority Han Chinese. Memtimin Yasin, the leading official of the Chinese Communist Party for No. 11 Village in Qaraqash’s Hanerik township, confirmed the incident in an interview with RFA. “In the early morning on May 20, five suspects armed with knives went to the Qaraqash River by motorcycle,” the village party secretary said, adding that most of the dam workers were asleep in tents near the site. Authorities took nearly two hours to travel to the location of the incident due to the distance and other complications, he said, and by the time they arrived, the suspects had already escaped. “That day, all the village chiefs and party secretaries in Hanerik township were notified to assist in police operations, particularly in conducting house-to-house searches,” Memtimin Yasin said. “After 15 days, authorities had arrested three of the five suspects, while the other two remain in hiding. One of those who escaped was a resident of my village, so I am working hard to assist the police in their search for him,” he said. “Usually, fights or quarrels occur between Han immigrants [to Xinjiang] and Uyghurs over land and water disputes, or sometimes over cultural differences,” he said. He said that around 300 people in Hanerik township had been detained for questioning in connection with the attack. “I know 52 people from my village [who were detained], including all of the suspect’s family members over the age of 14, his close friends and former classmates,” he said. Residents of Hanerik township also confirmed the incident, saying the alleged attackers were members of a group which sought independence for Xinjiang from Chinese rule. “Police and village officials searched my home three times because one of the suspects was my eldest son’s former middle school classmate. I heard about the incident through their conversation,” one resident, speaking on condition of anonymity, said. “[It was] a separatist group—all of them were from our township,” a second resident said. The teacher said that Uyghurs are no longer targeting their attacks only on authorities in Xinjiang, as more and more Han Chinese move to the region. “In the view of the attackers, the Han workers in the region are not civilians, they are part of the tools of colonization and they are siding with the army and the police all the time,” he said. Xinjiang has seen a string of violent incidents since June 26, leaving at least 64 dead in total, as the region marked the fourth anniversary earlier this month of July 5, 2009 clashes between the minority Uyghurs and majority Han Chinese. Rioting in Urumqi left some 200 people dead and 1,700 injured in the days that followed the 2009 conflict, according to official media reports.